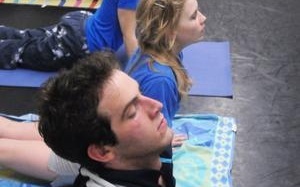 The blog, veritasyoga.wordpress.com, features a compilation of all the schedules for the various yoga classes offered on campus—at the Malkin Athletic Center, the Hemenway Gym, and in the Houses—that were previously publicized only on separate lists. Robinson said yoga can serve as a form of relaxation for Harvard students. “Harvard is a stressful place and it’s nice to chill out for a while,” she said. In the past few years, the number of classes offered per week at Harvard has increased from approximately two to ten or twelve, according to Dawn M. Stenis, Harvard Recreation’s area fitness program manager. In the gyms, yoga classes, especially those in the evening, fill up quickly. Students must arrive 15 minutes before class to claim a spot in the class, said Stenis. Robinson’s blog also features information about the Harvard College Meditation Club, led by Bo-Mi Choi, a former lecturer in social studies at Harvard who is currently affiliated with the Cambridge Zen Center. Choi said she agrees that yoga can be a form of relaxation. However, she said that if students begin the practice of yoga and meditation with the sole goal of stress reduction in mind, they will miss or overlook another significant benefit. Choi leads a one-hour Zen meditation session on Wednesdays in Adams House that consists of breathing exercises, chanting, and 20 minutes of meditation followed by a question and answer session. Last year, the club consisted of five freshmen. This year, it has grown substantially, and more than 15 people have attended the first few meditation workshops. Bikram, Hatha, Vinyasa. You name it, and chances are I’ve tried it. After all, I did do my first sun salutation all the way back in the seventh grade when my school offered yoga in conjunction with hip-hop dance as an alternative to sports or fifth-period P.E. class. I’m still not sure who decided Missy Elliot and Tibetan meditation chimes would pair well, but my friends and I were willing to do anything to avoid picking up a field hockey stick or softball. With all but one upperclassmen House offering free yoga sessions this semester, students have latched on to the opportunity to stretch and rejuvenate in a relaxing environment as a complement to their hectic lifestyles.